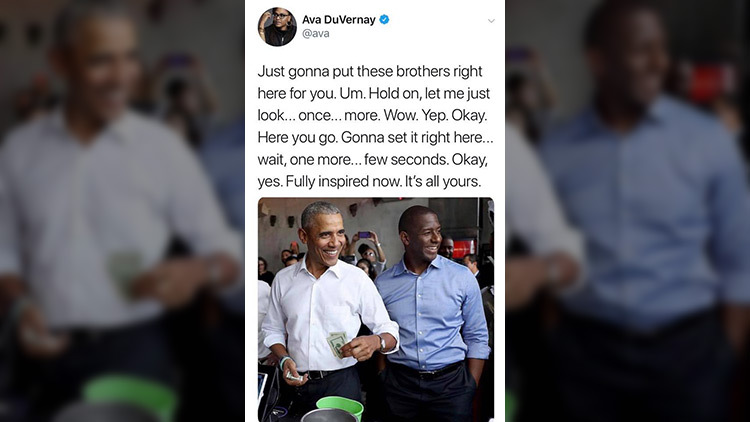 Former U.S. President Barack Obama's appearances at Democratic rallies in Florida for Senator Bill Nelson and gubernatorial candidate Andrew Gillum over the weekend drew record crowds and left many people in tears, happy to have Mr. Obama back on the national stage. Since the transition of power after the 2016 election in which Donald J. Trump beat Hillary Rodham Clinton in an electoral college victory, many Democrats and the generation that helped put Obama in the White House have been dismayed by his conspicuous silence on Trump and indeed by his virtual disappearance from the public view at all. Or as New York magazine said in January, "The most popular American, whose legacy is the primary target of Donald Trump, has, for now, virtually disappeared from public life." "The people around Obama are living in Trump’s America, too, they remind skeptics of his approach. They’re just wagering that the former president’s bet pays off," the piece goes on to say. "He’s recognizing that the party and our country will benefit from other voices having an opportunity to weigh in, and that opportunity would be all but completely obscured if he were regularly sharing his opinion on these issues," says Josh Earnest, who joined Obama in the early days of his first presidential run and finished the administration as Obama’s last White House press secretary. "It is far too early to tell whether that works." Obama's respect of the holder of the Executive Office, strategical silence, and public reappearance has paid off, judging by his response this weekend, as he was greeted with celebrity-sized crowds, especially when he went to get lunch at Coyo Taco in Wynwood, Florida. According to the Miami Herald, the people of the town lost their minds-- "women screamed as Obama stepped out of a silver Chevy Suburban onto Northwest Second Avenue around 3:45 p.m.. They grabbed their cellphones to snap photos and call their friends." Without mentioning by name, Mr. Obama shredded Trump’s policies and put Republican politicians seeking re-election who voted to repeal the Affordable Care Act (ACA aka Obamacare) on blast saying about their claims to the contrary, "That's some kind of chutzpa; let's call it what it is. It's a lie." Obama repeated a talking point he's made publicly for a few weeks now, that Trump promised to “drain the swamp,” but that his administration has racked up enough indictments to fill a football team. "Just gonna put these brothers right here for you. Um. Hold on, let me just look... once... more. Wow. Yep. Okay. Here you go. Gonna set it right here... wait, one more... few seconds. Okay, yes. Fully inspired now. It’s all yours." 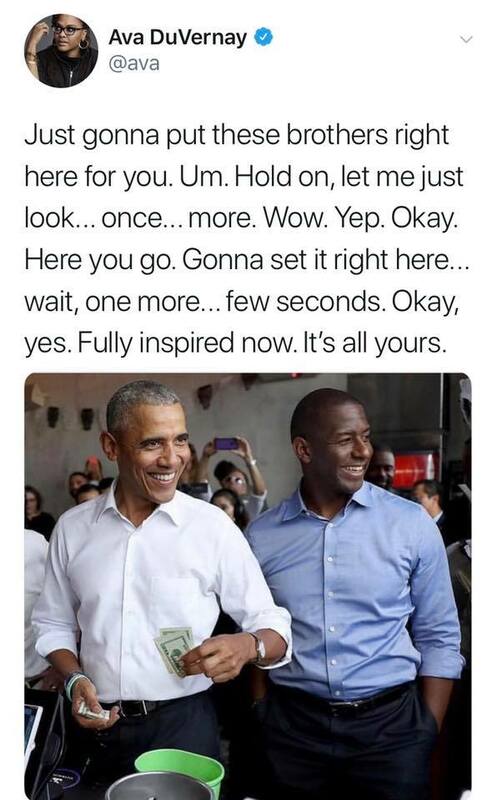 Gillum added a call to action to the people gathered in the audience saying, "Don't Tweet about it and think your job is done—be about it and vote." Watch the full speech below!